The tide is turning in wildlife tourism -- and it's a good thing for animals. While Southwest Airlines recently dumped its partnership with SeaWorld after intense public backlash, other travel companies are taking the moral high road, too. Responsibletravel.com, which dropped elephant riding tours, citing a myriad of reasons why they are harmful to elephants, has released the world's first elephant travel guide. 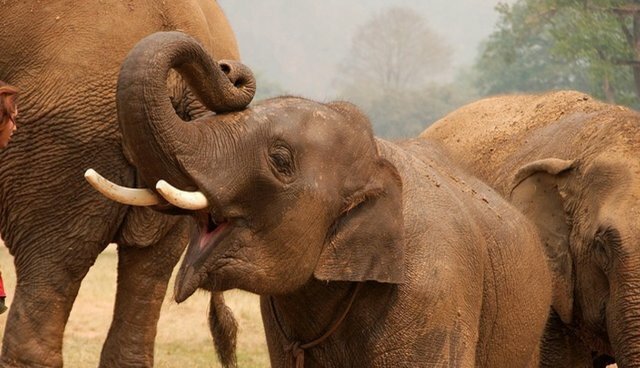 Now, travelers wanting to see elephants can do so -- without hurting them. The guide, which you can find here, includes a breakdown of the ways that elephant rides can be harmful, as well as a searchable database of different locations in several countries. Using this database, tourists can find volunteering opportunities and conservation projects to visit that will actually benefit wild populations. "We hope this guide will become a leading resource for travellers concerned about the ethics of visiting elephant sanctuaries and taking part in elephant rides around the world," Justin Francis, Managing Director at responsibletravel.com, said in a release. "For us, it has resulted in the decision to no longer promote elephant riding trips on responsibletravel.com, or any trip which includes the opportunity to see trained elephants perform for the public." The news comes after Intrepid Travel, the world's largest travel company for young people, stopped providing elephant trekking tours to tourists in Thailand, citing the industry's terrible record with animal welfare.